Got a shoe design to rival Louboutin, but don’t know where to start? The University of Ottawa has a space for you. Doug Commons grins as the fragile orange robot rolls across the table towards the edge. His ‘class’ sits transfixed. 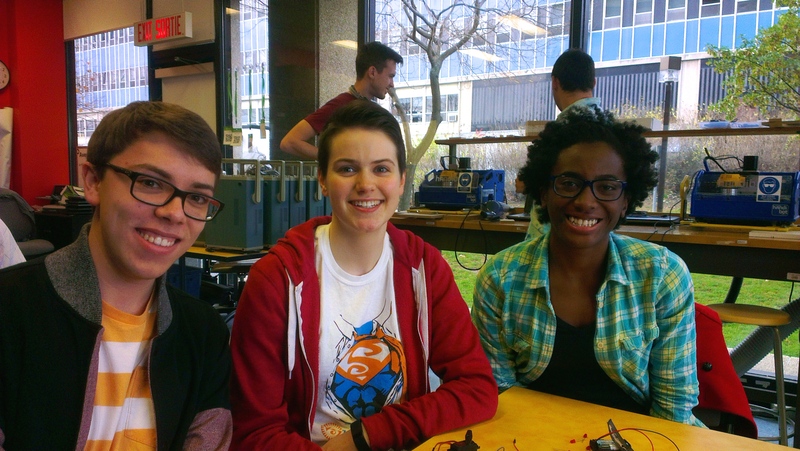 Ryan Gill, Veronica Carpani and Danielle Latty are biomedical engineers at the University of Ottawa. They smile as ‘Rolly 2’ suddenly turns centimetres from oblivion and lurches away towards safety. The demonstration over, Doug scribbles out a circuit diagram, explaining to his audience why Rolly 2 doesn’t like to fall. 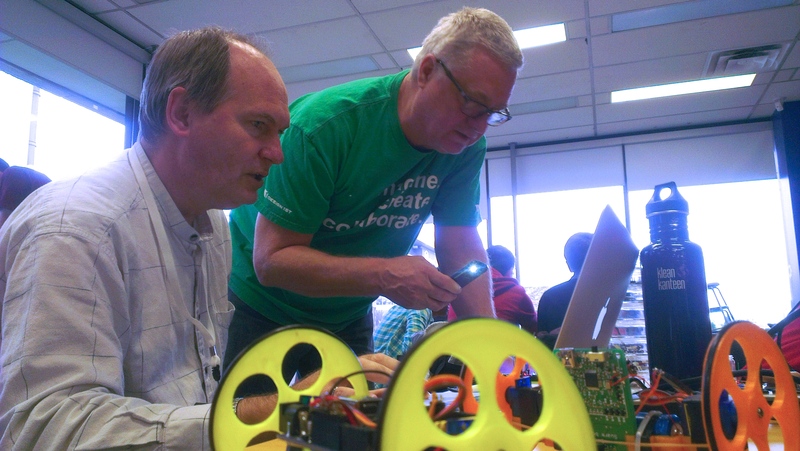 Doug Commons (seated) brings decades of electronics experience to the uOttawa Makerspace. In the foreground is ‘Rolly 1’ and ‘Rolly 2’ from left to right. Doug is one of many regulars at the University of Ottawa Makerspace. Aside from sharing his decades of electronics expertise with tomorrow’s biomedical tech stars, the retired electrical engineer is also a ‘maker’ club mentor at the Glen Cairn Public School in Kanata. From left: Ryan Gill, 20, Veronica Carpani, 20, and Danielle Latty, 20, are Biomedical engineers from the University of Ottawa. Veronica explains what they hope to achieve with their robot project. On November 20, the Faculty of Engineering will officially launch the Makerspace. The public is invited to visit and learn about what happens in this modest room, which is not much larger than a typical suburban garage. Visitors will be introduced to MakerBots, Handibots, Arduinos, Raspberry Pis, and all sorts of tools and tech that makers use to create robots, drones, toys, and even human prosthetics. The event will also host the very first uOttawa Maker Showcase, where creative people from all over Ottawa will be presenting their homegrown projects. The space is run by five student coordinators and managed by University of Ottawa Faculty of Engineering staff, Hanan Anis and Frank Bouchard. The goal of Makerspace, according to Anis, is to offer students, staff, and the local community a space where they can use tools, share ideas and work together on projects. In the Ottawa area, it is one of a small number of similar sites open to the public. Click on the graphic above to learn more about the uOttawa Makerspace. The maker movement is a cultural phenomenon that is inspired by the do-it-yourself spirit of the digital revolution, where everyone can be a publisher. That has since moved into the physical world. These days, you don’t have to be an expert or require access to expensive, specialized tools to design and assemble increasingly sophisticated objects. “Makerspaces help put manufacturing into the hands of individuals, something that has not been present for several decades now,” said Phil Chiasson, one of the Makerspace coordinators. He says that while the movement may seem to be about the cool tech, like 3D-printers, it’s really about collaboration. This is where volunteer experts like Doug are important. 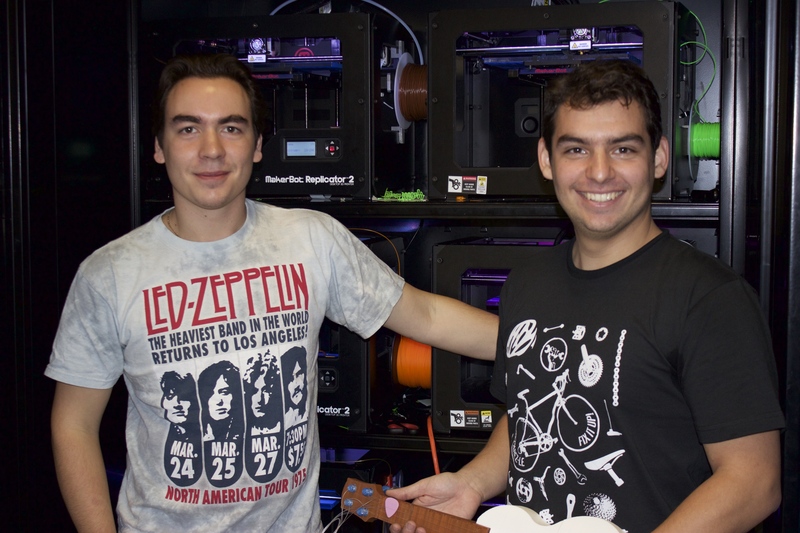 Steven Price-Williams (left), and Phil Chiasson, students coordinators at the University of Ottawa Makerspace. The Makerspace is already a popular space for makers of all ages. At a recent workshop, Chiasson estimated there were about 70 people crammed into the room. He’s thinking about expanding into an adjacent room, so workshops can be split into beginner and advanced classes. And while attendance is a good indicator of success, Chiasson is more excited about the impressive creations that will be on display this Thursday night. “When people have all the necessary resources to create, the possibilities are endless” he said.